This is a Chinese name; the family name is Mak. Juno Mak is a Hong Kong singer, record producer, actor, and director. Mak was born on March 18th, 1984. He is the second son of Clement Mak, chairman of CCT Fortis Holdings Limited. Mak began his music career as a commercial pop singer with Universal Music. Two albums, On the Road and Next Step, were released with Universal Music. Both albums reached the top spot on TVB. 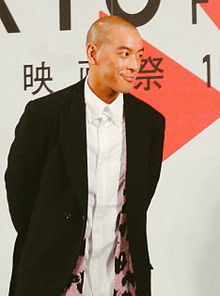 Although he won awards upon his debut, it was later rumoured that his fans were hired professional groupies earning up to HKD150 an hour, and in 2002 he was booed by audience members during an awards ceremony. In 2010, Mak wrote and starred in Wong Ching-po's film Revenge: A Love Story. The film was a hybrid of slasher and love story. Mak and Wong Ching-po collaborated again in 2011 on the film Let’s Go!. In 2013, Mak directed the film Rigor Mortis, which pays tribute to the 1980s Hopping Vampire (Jiangshi) Genre. In 2003, Mak, his father, and a number of music executives from TVB and Universal Music HK were arrested as part of an investigation into an alleged bribes-for-awards scam. The case was eventually withdrawn with no charges made. ^ a b c d "When it comes to Juno Mak, don't judge a book by its cover". 3 September 2013. Retrieved 17 July 2017.